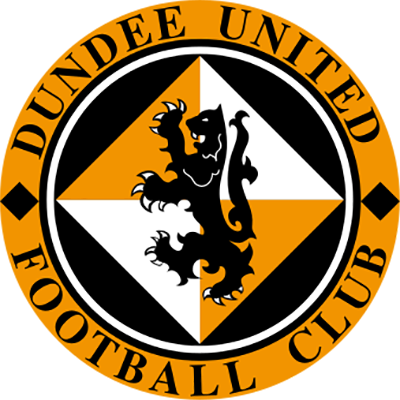 New signings Brandon Mason and Craig Slater went straight into the team, at the expense of the injured Mark Durnan and the suspended Paul McMullan. The home side had only won once in their previous ten league games, although that was not obvious as the game started, as they nearly took an early lead after four minutes when Craig Sibbald hit a low shot from the edge of the area which hit the post and rolled across the goal. Somehow, the ball did not cross the line before rolling out of play for a goal kick. United actually took the lead in this game after six minutes, with no hint of the chaos that was to follow. After Scott McDonald laid the ball off to James Keatings, the former Hibernian player floated a glorious ball over the top of the Falkirk defence for the onrushing Billy King, who rounded a defenceless Robbie Thomson in the Falkirk goal and tapped the ball home. It soon became apparent that this goal would be a rare highlight for the away side, and from that moment on were comprehensively outplayed by their hosts. Perhaps the only surprise was that it took Falkirk until the 21st minute to restore parity, such was their dominance. After 12 minutes, Louis Longridge became the second Falkirk player to hit the woodwork as he unleashed a fearsome long-range drive which had Harry Lewis well beaten. Five minutes later, Lewis was forced into action as he did well to touch a 20-yard drive from Sibbald around the post. 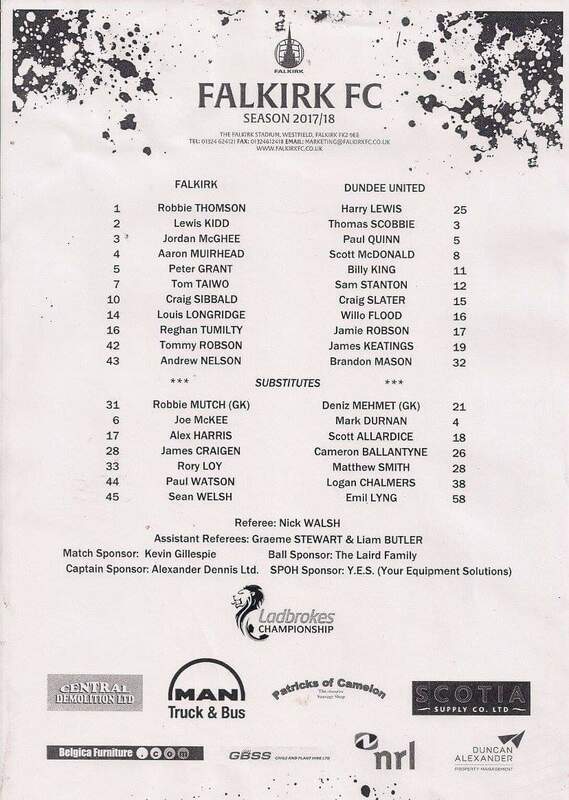 Then, after a cross from Longridge which caused chaos in the United defence after it flashed across the face of goal, amazingly Tom Taiwo became the third Falkirk player to hit the woodwork, with a thunderous shot that Lewis did brilliantly to tip onto the crossbar. Sibbald did look to be fouled by Paul Quinn as he attempted to head in the rebound, but the referee was unmoved. 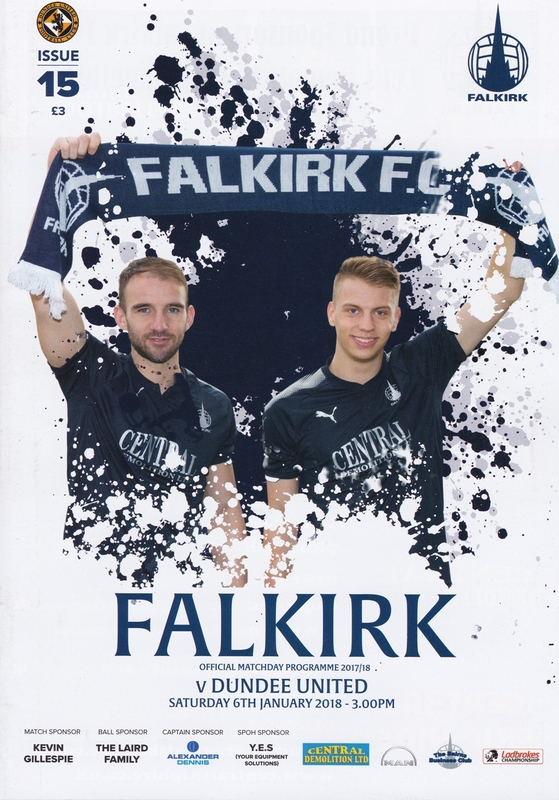 Falkirk then forced a series of corner kicks as they laid siege to the United goal. The equaliser felt like it was coming, and it did come after 20 minutes when Lewis rather got under one of those Longridge corner kicks, and the ball was nodded home by Peter Grant. The goal did not spark United into any sort of life, and the home side continued to dominate the game. Louis Longridge was continuing to cause the United defence all sorts of problems, and on the half hour mark he hit a shot from the edge of the penalty area which was deflected just wide. From the resultant corner, Lewis again looked less than convincing as the ball deflected off Willo Flood but the goalkeeper was somehow able to scramble the ball clear under pressure from several Falkirk players. Longridge then had another attempt on goal, this time curling a shot just wide from around 16 yards out, before Falkirk got the second goal their play deserved on 41 minutes. Again, Longridge was involved as he won possession in midfield and played the ball through to Lewis Kidd, who cut the ball back to Reghan Tumilty who struck the ball past Lewis to give the home side the lead. Disappointingly for the large travelling support, half time did not alter the pattern of play and Falkirk continued to dominate. Two early corners caused yet more problems for Harry Lewis, with the goalkeeper having to pull off another stunning save five minutes into the second half from a Jordan McGhee header. Six minutes later, Louis Longridge made it 3-1 and got the goal he deserved as he cut in from the right with no United players anywhere near him, and curled a superb effort past Lewis with his left foot. 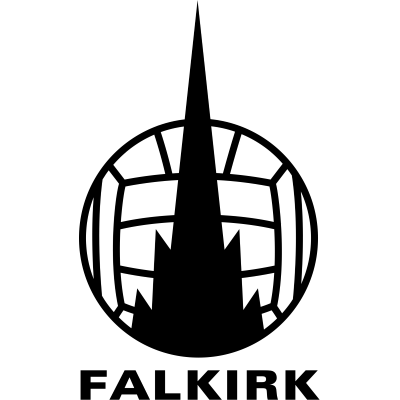 By way of a response, Csaba Laszlo brought on new signing Emil Lyng for Craig Slater, but the change had no real impact as United were unable to create anything, and were unable to resist the continued waves of Falkirk attacks. After a run and shot from Andrew Nelson which flew just wide, eight minutes after the third goal Falkirk added to their lead when Nelson held off his man, broke forward down the right and teed up Thomas Robson who smashed in a drive off the underside of the bar and into the net. The United players looked utterly shellshocked, and were unable to resist against the rampant home side. Indeed, Falkirk should have had a fifth goal after 68 minutes when another cross from Longridge found Jordan McGhee unmarked and only two yards out in front of goal, but luckily for United they were spared any further pain, at least temporarily, as McGhee somehow managed to miss the ball completely. The fifth goal, however, was not to be delayed for long. After 73 minutes the impressive Louis Longridge scored his second goal of the game. It was very similar to his first goal, as again he cut in from the right-hand side and curled in a shot at the far post with his left foot. As before, as good a strike at it was, he was under very little pressure from any United player, most of whom looked utterly demoralised by this stage of proceedings. This was not the end of the pain for United. A mere two minutes after the fifth goal, Lewis Kidd blasted a shot from 20 yards just over the bar, and Longridge managed yet another shot which this time went wide of the post. The Falkirk players were showboating by this stage, and not even a rare attempt on goal from a Jamie Robson free kick when flew just past the post could spoil the mood. In the last minute, United’s humiliation was complete as Falkirk made it six with an exquisite goal. Craig Sibbald, who had run the show all day, took the ball inside and cut the ball back for the unmarked Lewis Kidd to fire the ball home. The goal meant that this game was United’s worst defeat in the second tier for almost 60 years, although based on the abject performance this humiliation was entirely deserved.